When lower carb diets are well-planned, they can have many benefits. However, most people assume that alcohol isn’t possible on a carb-restricted diets, but this is incorrect. This article will provide an A to Z guide of the best alcohol options for someone using a low carb or keto diet. From alcohol with no carbs to drinks loaded with sugar, we will review them all. But first, it is important to be aware of the pros and cons of drinking. What Are the Health Effects of Alcohol? In truth, the health effects of alcohol are a mixture of positive and negative, over both the short and long term. Alcohol increases circulatory levels of high-density lipoprotein (HDL cholesterol). HDL is negatively associated with cardiovascular risk (1). Some alcohol, such as red wine, contains significant amounts of polyphenols and it could be health-protective in moderation (2, 3, 4, 5). Based on a meta-analysis of observational studies, low to moderate alcohol consumption may lower the risk of type 2 diabetes (6). Moderate alcohol consumption is associated with lower mortality from a heart attack (7). 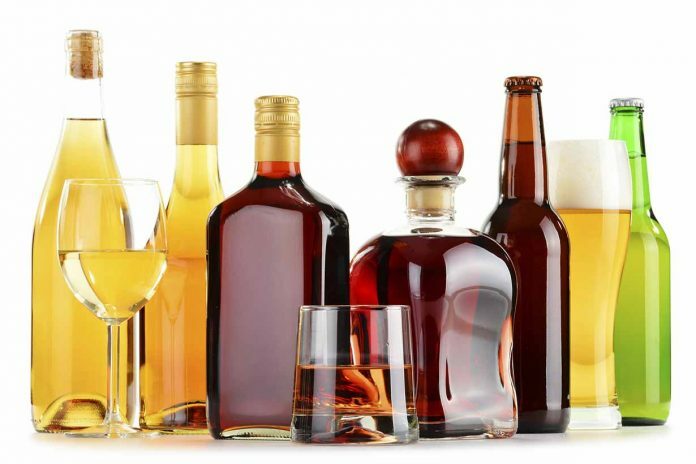 Here is an in-depth look into alcohol and how it affects longevity. For some people, alcohol can be extremely addictive, and early onset of alcoholism is not uncommon (8). It’s well-established that alcohol raises the risk for alcoholic cirrhosis and other liver diseases (9, 10, 11). While a small to moderate amount of alcohol may turn inflammation off, heavy alcohol consumption leads to systemic inflammation (12, 13, 14). Key Point: Overall, we can see alcohol has both positive and negative effects. As with many things, the dose makes the poison: drink sensibly if you choose to. Absinthe is a distilled alcoholic drink made from a variety of herbs and spices. Absinthe received an early 20th-century ban by many countries, including the United States and much of Europe. This prohibition came as a result of a belief that absinthe can cause hallucinations. The United States’ Absinthe ban was finally lifted in 2007. As one of the strongest alcoholic drinks available, the alcohol volume of Absinthe comes in at somewhere between 45-74% ABV. How Many Carbs in Absinthe? Alcopops arrived in the mid-1990s, initially in Australia and the UK, followed by the United States. As the drinks mask the taste of alcohol and resemble sweet drinks, alcopops attracted widespread criticism for appealing to teenagers. While not as popular as they were at the turn of the millennium, they are still available to buy. How Many Carbs in Alcopops? If you hadn’t guessed, alcopops are far from being low carb alcohol. They are little more than sugar and artificial flavorings with a drop of cheap alcohol. Overly sweet in taste, the amount of added sugar in these drinks is scary. Clearly, there are many different brands which all have different recipes. However, you can expect upward of 30g. As most people don’t stop at one bottle, you can imagine how much sugar a night of drinking alcopops might provide. One of the market leaders in the category, Smirnoff Ice, contains 38g carbs per 12oz bottle (360ml). Alongside water and tea, beer is one of the three most popular drinks in the world. To produce beer, cereal grains such as barley and wheat are yeast-fermented. In general, the alcohol volume of beer comes in at somewhere between 3-12% ABV, depending on the brew. How Many Carbs in Beer? Overall, beer tends to contain between 1 and 15g carbs. Most beers you will find on the shelf are high in carbohydrate. However, the carbohydrate content of beer varies, and it depends on the type of beer and length of the brewing process. Commercial beers such as Budweiser and Heineken are not one of the best alcohol options for low carb. With that said, there are also many low carb beers available, and many of these tend to be the ‘light’ version. Unfortunately, the only way to know the carbohydrate content for sure is to research your chosen brand’s nutritional information. While some of the light beers are reasonably okay, beer is far from the best low carb alcohol. For more on beer, see this guide to its benefits and drawbacks. Brandy is a spirit usually made from grapes. Originally, the starting point is a kind of base wine, which is then further distilled and matured. Brandy is traditionally consumed as an after-dinner drink. It also has culinary purposes and is a popular choice for flavoring dishes. Typically, brandy has an alcohol content starting at 35%, but it can be up to 60% ABV. It’s also one of the best alcohol options for a low carb diet. How Many Carbs in Brandy? Brandy is a no carb alcohol (16). When you think about champagne, most people imagine celebrations such as engagements and weddings. Up to the present time, people view champagne as a kind of luxury drink. To describe the taste, it’s slightly sweet (even the dry version), sparkling and easy to drink. How Many Carbs in Champagne? In general, champagne is one of the best drinks for low carbers. On the downside, it’s also one of the most expensive! However, the kind of champagne you buy is also important. Opting for dry champagne is an excellent choice; stay away from sweetened champagne as it is very high in sugars. Ordinarily, dry champagne contains about 2g carbohydrate per 5fl oz (150ml) (17). Cider is a fermented crushed fruit drink usually made from apples. However, a broad range of fruit ciders also exist. There are several different varieties of cider on the market. While some of these are traditional, others are the result of mass-production. How Many Carbs in Hard Cider? Sadly, many of the commercially-produced ciders contain a variety of additives, such as high fructose corn syrup. Not surprisingly, these drinks are little more than alcopops and contain significant amounts of sugar. The best thing to do is to look for traditional dry cider, as it is lower in sugar. This traditional cider’s production uses 100% apple juice. In summary, the carbohydrate content of cider can vary a lot. ‘Angry Orchard’ is an example of mass-produced cider, and it contains 21g sugar per 12oz bottle (18). On the other hand, a more traditional cider such as ‘Doc’s Draft’ contains 8g sugar per 12oz bottle (19). Still, neither of these are low carb alcohol drinks, and they don’t belong in an LCHF diet. Gin is another ancient distilled spirit, believed to originate from England in the middle ages. People make this gin from a group of ingredients including fermented grain and juniper berry. Gin is especially popular for use in cocktails, although many of these tend to be high in sugars. How Many Carbs in Gin? Gin is one of the best alcohol options for a low carb diet (20). Compared to most of the alcoholic drinks on this list, Jagermeister is a relative newcomer to the scene. Originating in 1930s Germany, the production of Jagermeister involves steeping 56 different herbs, roots, and spices in alcohol. Following this, the mixture will age in an oak cask barrel for 12 months, after which the producers mix it with sugar. Quickly increasing in popularity, Jagermeister is, at present, a ‘trendy’ drink for young adults. Interestingly, Jagermeister’s marketing calls it a “secret recipe of 56 natural ingredients”. How Many Carbs in Jagermeister? Unfortunately, Jagermeister is one of the worst drinks for carbohydrate content. Jagermeister contains 11g carbs per 1oz serving (30ml) (21). A relatively simple concoction, making mead requires only three ingredients; honey, water and yeast (or other fermentable). Mead is one of the oldest alcoholic drinks on earth, if not the very oldest. Known as “the drink of the gods” by the ancient Greeks, it remains popular to this day. Notably, there are records of the Chinese, Greeks, and Africans consuming mead from as far back as 3000 BC. How Many Carbs in Mead? Unfortunately, just like the honey it’s from, mead isn’t light on carbohydrate. An 8oz (240ml) serving of mead contains a staggering 40g carbs. In other words, it’s far from being a low carb alcohol (22). Red wines, for the most part, are some of the best alcohol options for a low carb diet. However, it is worth noting that some wines can be very low in carbs while others can contain significant amounts. To learn about the best wine options, see this article here. Secondly, it doesn’t have added sugars or flavorings like many other drinks do. For the most part, red wine is just fermented grapes. Various other wines not listed here also exist, with many varieties of berry wines enjoying popularity recently. Although the number of carbs in red wine will depend on the particular brand, it contains about 3.8g carbohydrate per 5fl oz (150ml) (23). Lesser known than red or white wine, rosé is growing in popularity. While many people believe that rosé is a blend of red and white wine, it’s more common for producers to use the maceration method. In essence, this means that the red grape skins only touch the fermenting grape juice for a small amount of time. How Many Carbs in Rosé Wine? As with any wine, the carbohydrate content will differ slightly depending on the grapes used and fermentation time. However, rosé wine is typically a little higher in carbohydrate than both red or white wine. On average, you can expect to consume 6.1g carbs from a 5 fl oz glass of wine (24). The production of rum involves fermenting and distilling a combination of water, molasses (or sugar cane) and yeast. Specifically, rum production began in the Caribbean during the 17th century. As you may know, rum comes in two varieties; dark and light. The difference between dark and light rum depends on the type of cask used for aging the rum. While light rum matures in steel, dark rum ferments in oak casks which contribute to it’s dark, golden color. As a spirit, rum is another no carb alcohol. Therefore, it’s safe to include as one of the better low carb choices—providing you don’t mix it with cola! Rum contains 0g carbs (25). Not as significantly known in the West, sake is the national drink of Japan. Produced by fermenting rice, sake contains approximately 18-20% alcohol by volume. Sake commonly takes 9-12 months to mature. How Many Carbs in Sake? Seeing that sake is mostly fermented rice, you might it to be extremely high in carbs. Generally, this is correct; sake contains 1.5g carbs per fluid ounce (30ml) (26). Far from the best option. The picturesque thought of sipping a zestful fruity drink alongside the Spanish coast; what else could it be except for sangria? First of all, for anyone who doesn’t know, sangria is a kind of Spanish cocktail. To make sangria requires a combination of red wine, various fruit, sugar and orange juice. Commonly, sangria arrives in a large jug that is full of various fruit pieces. How Many Carbs in Sangria? As you may have guessed, sangria is not the best alcohol for low carb. In fact, the carbohydrate content can be extremely high due to the juice, sugar, wine, and fruit. A small 5oz (150ml) glass of sangria provides approximately 14.4g carbs (27). Labelled the biggest alcohol drinkers per capita, the national drink of Korea is Soju. Despite the drink costing a fair amount in the Western world, it can be bought domestically for less than $2. It’s also strong; the average bottle ranges from 13 to 20% alcohol by volume. Given the low price, this is surprisingly high and probably explains why the Koreans are big drinkers. Soju is a distilled drink that, despite traditionally being made from rice, now tends to use starches such as potatoes. How Many Carbs in Soju? Owing to the large amounts of starch used in the production process, Soju contains 1.3g carbs per fluid ounce (30ml) (28). Given that Soju is typically drunk by the bottle, it’s not a good choice. The pride of Mexico; Tequila is now famous throughout the world. Surprisingly and as a somewhat unknown fact, the name is recognition of where the drink comes from—the city of Tequila. Tequila is the result of fermenting and distilling a beverage made from blue agave. Firstly, good news: tequila contains no carbs (29). Tequila is also very strong, with the law requiring it to be at least 40% alcohol to be sold in the United States. Surely everyone knows the Russian spirit vodka. What it lacks in taste (personal opinion!) it makes up for in strength. Similar to Korean soju, vodka is also a distilled spirit made from grains or potatoes. At the same time, it’s more than twice as strong, with US vodka required to be a minimum of 40% ABV. Vodka is also a good low carb option because it contains no carbohydrate (30). It’s important to realize that any vodka mixers will be high in sugar, as these drinks usually feature lots of sweet flavors. Whisky is produced by fermenting various grains and aging them in wooden casks. Despite the media love story with red wine’s polyphenols, whisky also contains a similar amount of antioxidants (31). As a result of whisky’s popularity, it is now produced throughout the world. How Many Carbs in Whisky? Whisky contains 0g carbs (32). Unlike popular belief, any grape can make white wine; white or red. For one thing, the only difference between red and white wine is whether the grape is skinless or not during fermentation. In other words; if red grapes undergo fermentation without their skin, the result will be a white wine. Thanks to Jelle de Roeck for this great graphic. How Many Carbs in White Wine? Similar to red wine, white wine is also very low carb. A 5oz (150ml) glass of wine contains approximately 3.8g carbohydrate (33). What is the Best Low Carb Alcohol? Despite making this for people who want to know the best low carb alcohol, I think it’s important to consider the ‘lifestyle aspect’ too. By this, I mean does finding the lowest possible carbohydrate content matter? Personally, I don’t think it does. If you have diabetes or a medical condition that necessitates low carb, or you drink regularly, then yes, seeking out the lowest carb alcohol is understandable. On the other hand, if you aren’t a regular drinker, then I think it’s better just to have what you enjoy. Rather than worry about 3 or 4 grams of extra carbohydrate and tell your friends the drink they bought you is “the wrong kind,” just enjoy it. To sum up, alcohol may have some health benefits when people consume it sensibly. Lastly, the best low carb alcohol options are spirits and dry red wine. Great and important information. Thank-you! As a guy who likes his martini’s (yes plural-that’s the problem), clearly keeping it to under 10 oz. per week would be a great goal. Really glad I found this Nutritional Advance website. Every tab has great reading. Good luck with your 10 oz target! There are some real hard ciders out there and it’s very easy to make yourself. Citizen Cider Wits Up has 2 carbs and 0 sugar per 16oz and tastes great especially with ice. Very informative and nicely done. I’m glad that you included Soju, which is becoming really popular in Los Angeles. Thanks! LA is well-known for its K-town, so I guess that makes sense. Yes, an easy comparison like ‘per 100 g’ would be good… although then I suppose some may ask how much it is per glass. I suppose both would be best! Had just asked on your comment part of your e book on nutrition about your opinion about alcoholic drinks, but this blog has answered virtually all my question – good stuff. This masterpiece should guide one how to safely tread on alcoholic drinks’ line. Thanks Alexander, glad you got something from it. Top guide. Nothing beats a good scotch. I’ve a few others to try on there. Yet to try which ones? Low Carb Wine: What Are the Best Options? Alcohol and Longevity: Does Drinking Increase Lifespan?